Starting at the visitors’ center, I collect a few pamphlets and talk to the friendly staff before walking the short distance to the Civic Museum of Sansepolcro . It is housed in Palazzo della Residenza which was constructed in the 13th and 14th centuries. 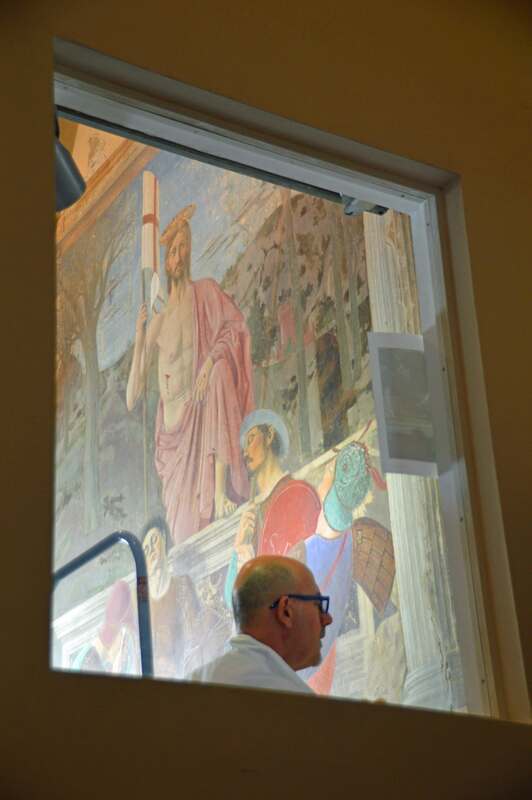 “The Resurrection,” a fresco by Piero della Francesca, that writer Aldous Huxley named the world’s greatest painting in 1925, is here and currently being restored. I watch as an expert conducts the painstaking work. 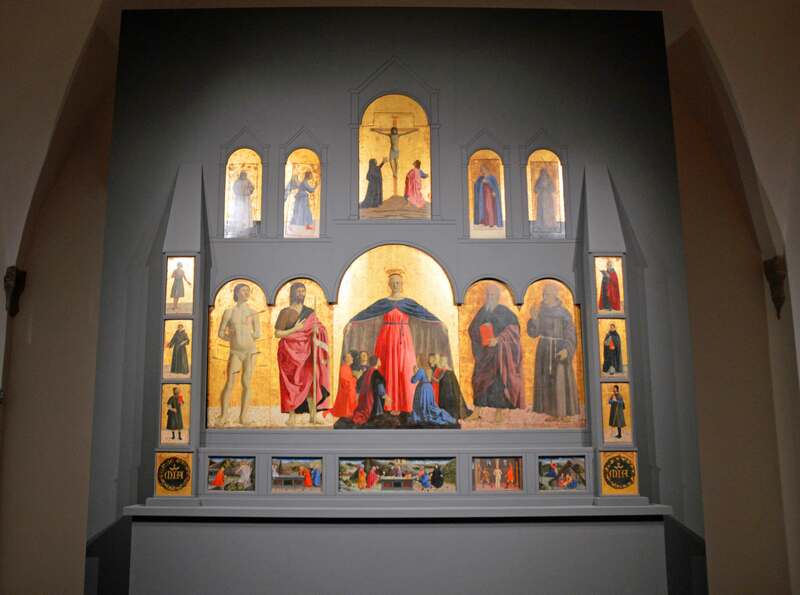 “Madonna Della Misericordia” is another of Piero della Francesca’s beautiful paintings featured in the museum along with masterpieces by Matteo di Giovanni, Raffaellino del Colle, Santi di Tito and other notable artists. After exploring the museum I head for the palazzo where Piero della Francesca lived as a boy and later in life. Recognized as one of the most important painters of the Renaissance, he came from a prosperous merchant family. Trained in mathematics, Piero’s interest in the abstract study of perspective and his contemplative approach to his paintings are apparent in all his work. This perspective had little influence on his contemporaries but came to be recognized in the 20th century as a major contribution to the Italian Renaissance. Today the cathedral looks much like it did in the 14th century with three naves supported by Romanesque columns showing Gothic influence. The cathedral retains many beautiful works of art including “Il Volto Santo”, an unusual carved wooden crucifix made from a single walnut log between the 8th and 9th centuries. 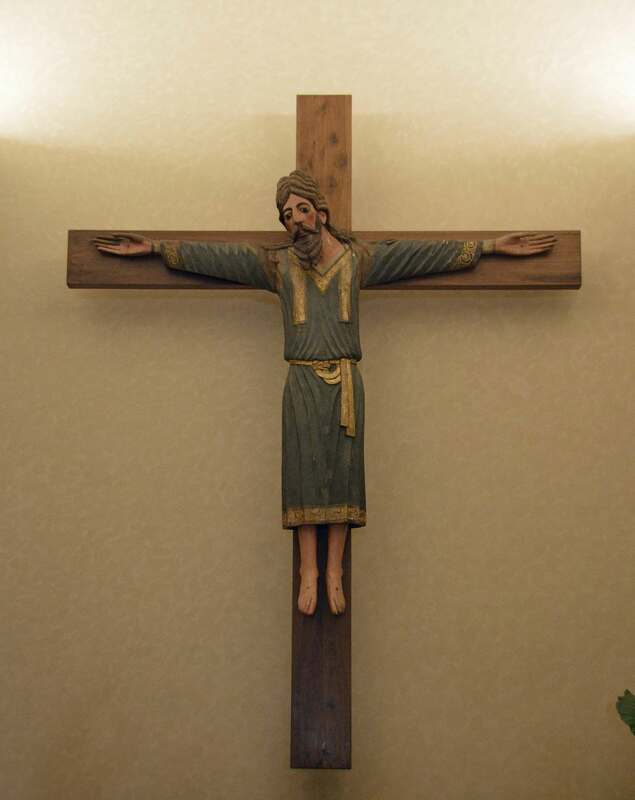 Carved wooden crucifix made between the 8th and 9th centuries. I end my short stay by having lunch at a café in the town square before continuing on into Le Marche and new adventures. I can certainly recommend Sansepolcro as a lovely place to spend the morning or for a much longer stay. 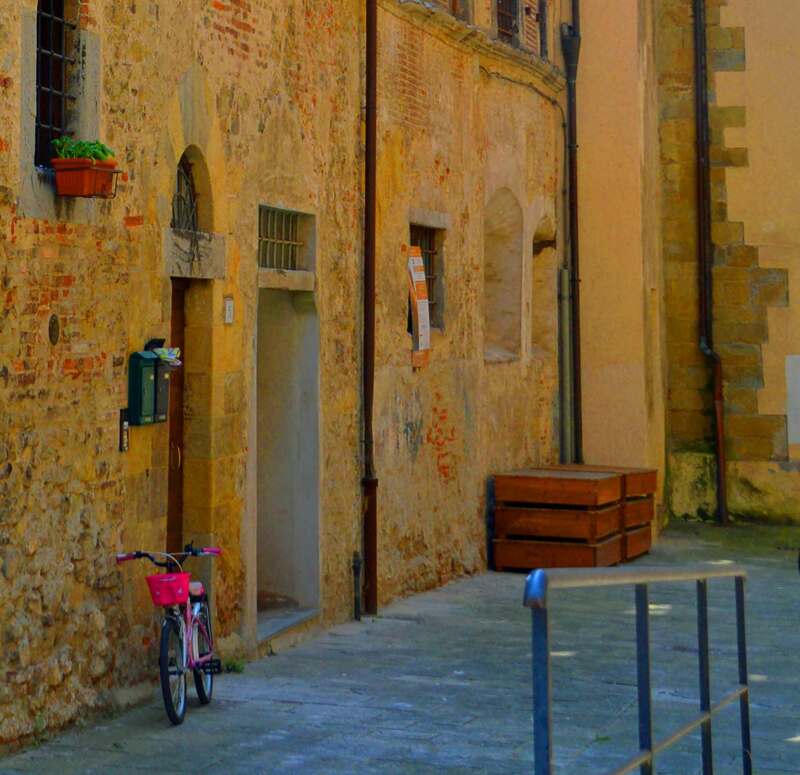 Sansepolcro is a beautiful Tuscan city. There are several other historic attractions to explore here and a whole community to enjoy. Loved the story and the pictures. Thank you Sharon! I was pleasantly surprised at what I discovered here! Beautiful article about Ren. art! Always fascinating. Thank you! I was very impressed with this museum in Italy! Super pictures, Marilyn. It’s amazing what one talented painter can accomplish. Good to see some being restored. 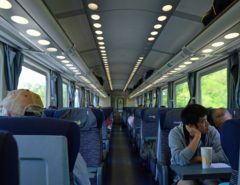 A painstaking process, but so worthwhile…and valued by travellers like us! Thank you! It’s hard to capture the beauty of the art in a photo. I was very happy I was able to visit the museum! Wow! What treasures to find in small town Sansepolcro, Italy. The art is indeed incredible and I can’t wait to visit here someday. Yours photos are beautiful but I was especially taken with the muti-tone, yellow brick building with the bike leaning against it. One can only hope that the rest of the town is so charming! Hmmm.. greatest painting in the world, eh, Huxley? 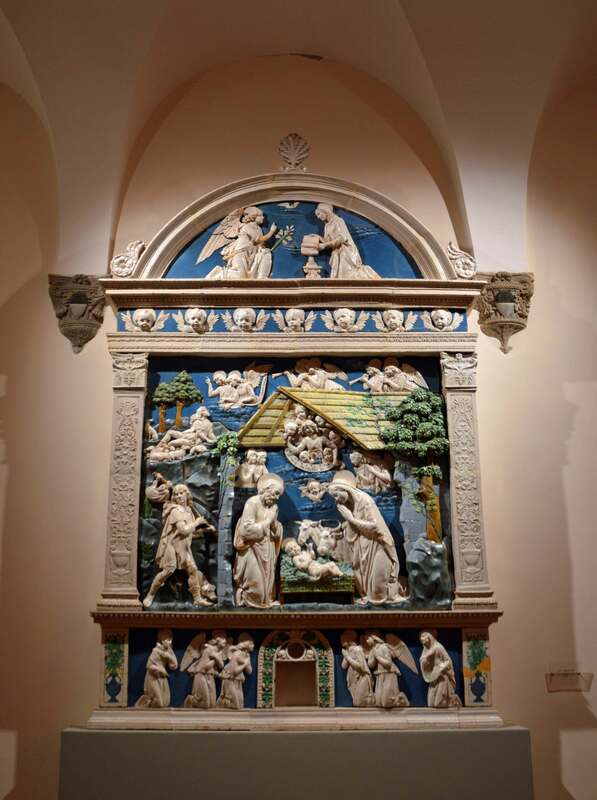 At least your visit to Sansepolcro allowed you to see it to decide for yourself! Looks like a jam-packed museum for its size. Art and opinions are very subjective. 🙂 But they had a lot of really nice pieces in Sansepolcro. I would love this destination! A small town with big beautiful art is right up my alley. Thx for sharing, Marilyn. It was a great little community and they’re very proud of their art. They’ve done a great job of preserving this heritage. I’ve never been to Sansepolcro (yet). It’s typical of Italy that a relatively unkonwn small town can have so many art treasures that it would be a major tourist destination anywhere else! So very true!! 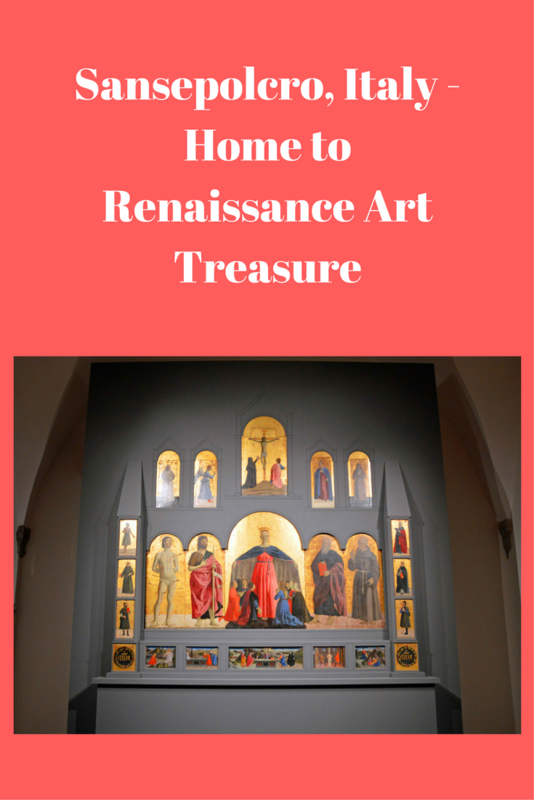 I stayed in a little village in Le Marche and was amazed at their museum of medieval art treasures! I’ve not heard of Sansepolcro, but it certainly looks worth visiting. Beautiful art and buildings. It always amazes me at how much beautiful art is still available to see in these type of small towns in Europe. What a lovely visit to Sansepolcro. Loved your photos! It was my first trip to Italy. My friend Cacinda Maloney told me for years that I needed to get there…she was right!! Amazing Renaissance treasures you found along your travels. I have not heard of Sansepolcro, but would love to spend some time there. The color in every photo is beautiful, and in addition, the patina on the street wall is divine. It would be hard for me to leave after just a morning. I was with a group and didn’t realize we were stopping in Sansepolcro until we arrived…a wonderful surprise! It was so lovely and the museums were excellent! We loved Sansepulcro and Piero della Francesca’s paintings and frescoes. We also visited Monterchi, a little town nearby to see Piero’s famous fresco in the little chapel. I would love to see Piero della Francesca’s fresco in Monterchi! He was an amazing talent! Thank you!!! I really appreciate your kind comment! !